I love chilled soups during the summer. I love vichyssoise. I adore a good gazpacho. Light, cold and refreshing -- just what I need for a summer dinner! 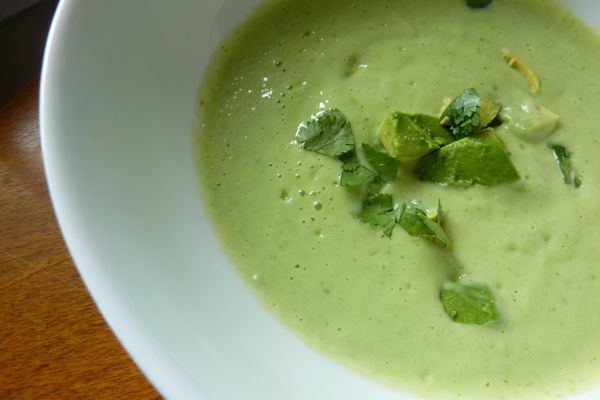 Well, this is my new go-to recipe for the summer -- Avocado and Cucumber Soup. I have literally made it three times in the last two weeks (thankfully for three different friends). Thank goodness my husband adores it too! It is so fresh and delicious and pairs perfectly with summer fare. Some chopping involved, but otherwise, dump the ingredients in the blender and let her rip. Creamy perfection! 4. as a sauce last night for poached salmon with cucumbers and dill (I had just a little left from the prior day's lunch). Honestly, when something is easy, healthy and tasty, I latch on to it like a life preserver. This recipe fits the bill. Try it out and let me know what you think. It is either universally enjoyed or my friends are all so hungry they will eat anything. I believe it is the former. *also a little tip - instead of buying buttermilk for recipes such as this, simply pour 3/4 cup of milk in a bowl, add 1/4 cup of vinegar. Let it sit for about 15 minutes and you'll have the equivalent of 1 cup of buttermilk.